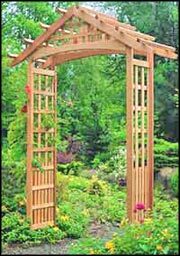 An arbor is a wonderful way to add height to your garden, yard, entry way or patio. If you have a large concentration of plants that have shorter heights, such as Hostas, or smaller flowering plants, an arbor can add the height that your yard or garden may be currently missing. They can also work as a transition point between ground plants, trees, and buildings. What is so nice about arbors is that they literally turn into their own natural living environment. You can plant climbing plants that can attract birds such as morning glories, or for a unique look, try grape vines.. Arbors also are used as arches that have a tendency to draw people towards them to enjoy some peace and serenity in the outdoors. Some arbors actually have benches built in them for you to relax on. Arbors are made out of different materials. For light-weight and low-maintenance try an arbor made out of vinyl. They can also be found in different types of woods such as cedar, and metals.